Sakaiminato is a very small city located on the border of Shimane and Tottori. While technically located on the Tottori side of the border, it’s very close to Matsue, the biggest city in Shimane. It is also close to Yonago, which has an airport making it easy to access this small city from Tokyo and Nagoya. The best option is to visit from Matsue as it’s just a short drive, or train ride to visit this cool small town. The city is famous for only two things. For most foreign people, it will be the seafood. Like most Japanese towns, this one is no exception. The crab is the most famous, but other seafood such as mackerel and squid are also somewhat famous. Due to the location and size of this city, it would be very difficult to find information in English, let alone Japanese on what food is good here. In fact, most of the Japanese guides never mention food, but rather mention the most famous activity in Sakaiminato. Unfortunately, I only spent a couple hours in Sakaiminato, so I can’t really comment on the taste of the food. I can say that the city feels more like a town than an actual city. The streets aren’t busy and most people enjoy the quiet streets. It can be easy to get lost in the area, so be aware of your surroundings. The most famous thing to do is to walk down Kitaro Street. It’s the last stop on the Sakai Line which starts in Yonago and ends at Sakaiminato. As with the rest of Tottori and Shimane, I highly recommend renting a car to get around as the trains run sparsely. Kitaro Street is very easy to find from Sakaiminato Station. Once you exit the station, just look around and you’ll see statues of various strange creatures. Once you head this way, you will be fine. The street is fairly short and shouldn’t take more than an hour or so to venture down it. Taking pictures can be tough as there are hundreds of small sculptures located up and down the street. One of the most surprising things to see is the fact that the entire street is full of images related to the manga. Everything from street signs to washroom signs has a Kitaro theme to it. All of the shops sell the various Kitaro souvenirs, including a few snacks. However, the biggest draw for souvenirs has to be the cell phone straps. These are extremely popular with Japanese people, especially manga themed ones. If you aren’t into shopping, located roughly in the middle is a small shrine dedicated to the creatures of this manga. 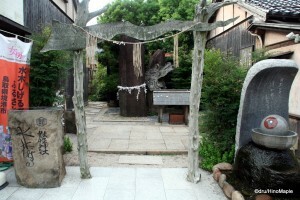 While this is not a true shrine in the sense that the gods are “real”, many people still enjoy the theme of the shrine. You can write your dreams and wishes on small wooden blocks that are cut into the shapes of some of the characters. There is even a large eyeball floating in a bowl of water that can be turned. 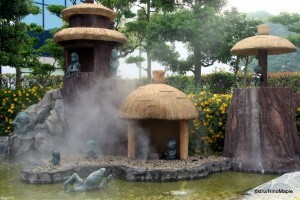 If that isn’t your thing, you can also relax inside a very small park which was created to look like Kitaro’s home. All of the major characters are inside and you can see their relation to Kitaro himself. 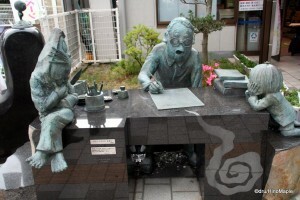 If you have never read Kitaro, or you aren’t interested in it at all, this place may not be interesting for you. If you are curious about Japan’s obsession with its characters and “idolization” of their cultural treasures, this place is great. If anything, the city is a nice and quiet place to visit if you walk just outside the main tourist street. This entry was posted in Chugoku and tagged Gegege no Kitaro, japan, Kitaro, Kitaro Street, Kitaro-dori, Matsue, Nagoya, Sakai Minato, Sakaiminato, Shimane, Shimane-ken, tokyo, Tottori, Tottori-ken, Yonago, しげるどり, みずきどり, ゲゲゲの鬼太郎, 名古屋, 境港, 島根, 島根県, 日本, 東京, 松枝, 米子, 鬼太郎, 鬼太郎道, 鳥取, 鳥取県 by Dru. Bookmark the permalink.